Warning Signs: Is National Poetry Month an Oxymoron? April 1st marks the beginning of National Poetry Month and I want you to restrain yourself from dashing around trying to find a single book or anthology of poetry where you call home. If you do have one, it likely is something you brought home from college or an older relative gave you as a birthday gift. Poetry does not line our bookshelves and plays virtually no role in our lives these days unless you are older and developed a liking for it in your youth. I not only liked it, but wrote it in younger days. In 1972, Pocket Books, a division of Simon and Schuster, actually published a softcover collection of my poems. Two years earlier, I had attended the annual Bread Loaf Writers’ Conference at Middlebury College in the Vermont town of the same name to write an article about it for Publishers Weekly magazine, then and now the bible of the book industry. Some of the nation’s best known poets led seminars; Galway Kinnell, Miller Williams, and Maxine Kumin were among them. If you don’t recognize their names, few others do either. This is not to say they didn’t write some wonderful poetry, but rather to point out that poets in our present times have sunk from sight, are rarely noted in popular print or broadcast media. The last time I saw a poet on television it was Richard Blanco, reading a poem of his at President Obama’s second inaugural. It was a forgettable poem and it was obvious that the only reason Blanco was there was because, as the DailyBeast.com prominently noted he was “Hispanic, openly gay, and the youngest inauguration poet ever.” He was there for political, not poetic reasons. By contrast, John F. Kennedy invited Robert Frost, perhaps the most recognizable of poets in his time to share his inauguration. It may surprise you to know that the U.S. has had an official Poet Laureate when legislation was passed to change the name of the post from the Consultant in Poetry to the Library of Congress. The position dates back to the 1930s and was held by men and women of real distinction as poets. There was Robert Lowell, William Carlos Williams, Gwendolyn Brooks, and, at present, Natasha Trethewey. If you have not read a line of their poetry, don’t feel bad, most other Americans have not either. I have been a book reviewer for more than fifty years and a founder in 1974 of The National Book Critics Circle. I rarely take note of any poet in my monthly report on new books, Bookviews.com. I do, however, recommend a good anthology of poetry when I find one and the last one was “The Seashell Anthology of Great Poetry” in 1996, almost twenty years ago. It encompasses poets from Shakespeare to the moderns. I receive requests daily to review all manner of books, but I always turn away those for poetry. It’s not that I don’t like poetry, but experience has taught me that, if I take note of an individual poet’s book, I will be besieged by countless others. I don’t like turning poets away from my door and, if truth be told, I haven’t read much poetry written since the days of Robert Frost. Too much of it abandons the rules of poetry, from rhyming to cadence. It is more often than not prose masquerading as poetry. 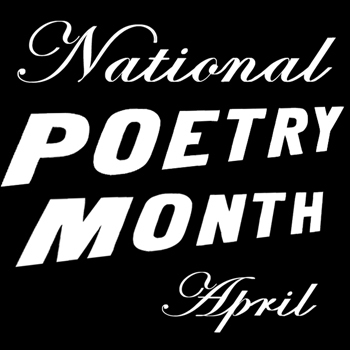 In the April 1st edition of The Wall Street Journal, Joseph Epstein, an author, took note of National Poetry Month in a commentary, “The Poetic Justice of April 1”, April Fool’s Day. He called the writing of poetry “an archaic practice, a dead genre, a done deal” and there is some truth in that if one aspires to be a published poet with expectations of being acknowledged anywhere than poetry journals. Don’t do that. Encourage any child to read and write poetry. It is a gateway to their soul, a wise mentor to the ways of mankind. Buy them a book of Dylan Thomas’s extraordinarily magical poems or Emily Dickinson’s and Edna St. Vincent’s Millay’s insights to the human heart. Give them the joy of Lewis Carroll. Let them discover Walt Whitman and Robert Frost. When I need solace or inspiration in my life, I read poetry. If it takes National Poetry Month to remind us of this great body of literature, that’s okay with me. There is so much wisdom to be found in poetry that I cannot imagine a life well spent without it. Drove my teachers quite wild. And what was in store. A waste of good skin. But they knew not how much. Have all come to pass. Your title made me laugh! You have to ask that question? Of it's an oxymoron. I enjoyed your piece that made reference to Joseph Epstein in the April 1st WSJ. Since WSJ does not permit me to comment there, I hope you won't mind my using your comment space as a means to give myself satisfaction. Nothing I have to say is out of line with your thoughts about poetry but in fact runs somewhat congruent with them. Mr. Epstein begins his piece assuring his reader that "the biggest fools of all may well be those who believe that contemporary poetry matters in the least...." What he means is, "Contemporary poetry does not matter to me." This is too bad, for him, but really nothing new under the sun. His closing adjuration, mommas don't let your babies grow up to be poets, echoes something a lot of people have said, not the least of whom is T.S. Eliot. Fondness and foolishness have always been bonded together, and that is where the heart of poetry lies. Homer is exceptional; but all that poetry (including some very great poetry) requires is for one verse or one line to strike a chord in one reader. Many classics have been salvaged thanks to a single copy someone held onto. The academicization of poetry is an odd phenomenon, and perhaps has more to do with the money available to it in the form of literary prizes and emoluments, which--highly publicized endowments aside like that of the pharmaceutical heiress to Poetry Magazine--seems rather more illusory than not. Epstein is tongue-in-cheek and stinting, though I am not sure if that is always to his credit. Thank you, David. Epstein may have written with tongue in cheek, but I took him at his word. My friend, Maxine Kumin, a former US Poet Laureate, enjoyed my commentary too. I imagine that Epstein would agree with your concluding statement, and I suspect his scorn arises from a genuine hurt or disappointment that (he feels) poets of a later date have not lived up to that "greatest generation" whose lines he remembers so well.